Cables are stocked in many lengths. Use these RJ50 10P10C cables to connect to electrical equipment such as data acquisition devices, test equipment, and PC accessories. These attractive cables are available with various lengths and shielding options. All cables have all ten conductors wired straight through (Pin1-Pin1, Pin2-Pin2, etc). RJ50 cables are sometimes referred to as "RJ45 10 pin" cables even though not technically accurate. RJ45 (8P8C) connectors have eight pins, whereas the RJ50 (10P10C) connectors on these cables are the same physical size, but with 10 pins. Male-to-male patch cables and male-to-female extension cables are both available. 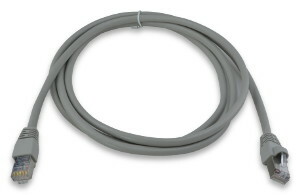 All cable styles use 26 AWG wire. The flat unshielded cable does not use twisted wire pairs; wires are run flat and parallel. NOTE: CBM10R2TS-6 is temporarily out of stock. More expected late April.